Successfully Added Thrifty Digital Camcorder to your Shopping Cart. High quality digital video recording at a budget-friendly price. This Thrifty Digital Camcorder is the ideal amateur camera for catching those exciting YouTube moments or sharing pictures/videos with friends and family. For those who prefer convenience and ease of use over "additional features" that may never be used. With more than enough to get you going, including 640x480 video recording, 4000x3000 resolution pictures, and even audio recording, this digital camcorder is the ideal everyday-use device for any situation. Heading to your kid's ballgame, going on a family outing, or know people that like to do crazy things? No matter your needs, this digital camcorder is a great choice! With easy access button controls and an intelligent user interface, this Thrifty Digital Camcorder allows for quick and easy capturing of pictures and videos. Whether you are an amateur photographer or aiming to create the next YouTube hit video capturing events on the go has never been easier. Transferring and uploading files to your computer is just as easy - just install the drivers and connect the USB cable to the digital camcorder! Quality specs at a budget price, this digital camcorder is poised to be the perfect resale item. Perfect for amateur photographers and YouTube enthusiasts alike, get one today to see how great this camcorder is, then order in bulk to enjoy per item and shipping savings. Better yet, order now and we'll express ship it out tomorrow! Brought to you by Chinavasion - your best source for high quality, low priced gadgets. 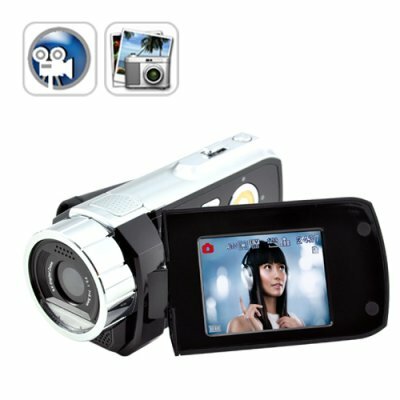 How do I set this digital camcorder up as a webcam? Turn the camcorder on and make sure the "WEBCAM" is selected in the USB options. Yes, this camcorder can give entry level DSLR cameras a run for their money.